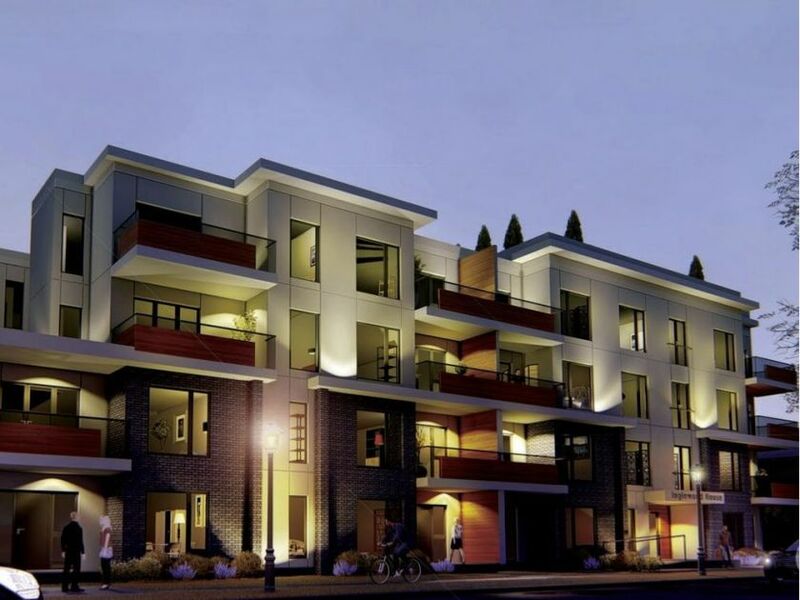 City council voted 9-4 in favour of Beljan Development’s application to rezone three lots in the southeast corner of Inglewood for a new four-storey development. During talks with the community, Beljan committed to making at least four three-bedroom units, including indoor parking for 20 bicycles, and adding a car share parking stall. The company also agreed to make a $66,300 commitment to Rocketship Park. Beljan’s Chris Dulaba said the location supports the city’s goal of creating density around transit corridors, and that adding some housing diversity will be a boon to the neighbourhood. He said he thinks more of this type of development will begin to spread into “first ring” suburban areas as prices continue to rise in the core. Hmm. Without any community support. Wonder why they couldn't get that one house. The render says "Inglewood House" on the entrance. I am sure there is some community support there and it certainly looks like a decent infill project. None that is being reported by the media - EJ and CBC and the other sites. Maybe you know more than they do. It's a pretty safe assumption that it's not proportionally indicative feedback but rather the NEGATIVE community commentary that comes out in the media... Firstly the people with negative opinions are usually louder and secondly the media often finds it more newsworthy. ..not to mention that most people FOR it typically do not show up to the meetings/hearings or write letters. I'm thinking there is an error in the article and they must mean 122nd Street and 111th Avenue as there is not a house on 111th at 123rd, just a small apartment building. Unless that's what was meant by house. Also the first two (maybe three) houses on the east side of 122nd from 111th have development opportunity signs on them. The only real issue I see is the positioning if it is indeed bracketed by houses. Other than that we can use buildings like these close to major arteries like 111th Avenue and 124 Street. There is a quote worthy of saving. God so true. It's harder to get letters of support or even fill out the forms at open houses than it is to garner support AGAINST something. It's tough getting letters of support unless a project is on the line. I also enjoy it when streets full of homes with garages and lane access cite that the streets are full of cars that park out front. That coveted parking space infront of your house that you claim to own. Indeed. We all recently witnessed the Oliver Community League "Board" recently speaking against a proposed land swap presumedly for ALL of its members (https://www.olivercommunity.com/the-...ould-you-know/) ... clearly though not the MOST as in "most people FOR it typically do not show up to the meetings/hearings or write letters". But then MOST people are not members of a Community League. I doubt of course OCL Board got proxies from the majority of it's members or from Oliver residents who are not members. That said, no one knows what the residents of Oliver would actually vote for or against - it is after all the decision of City Council. Last edited by EdmTrekker; 02-04-2019 at 09:12 PM. The building to the south of this site is an old apartment building. To the north is a duplex, which is why we designed the building to have a larger setback and applied a 3m stepback on the third and fourth floors. Hoping to start construction this summer. I like the design. I also think its a good fit for the location. My comments below have nothing to do with my favourable thoughts on the design and location of the project. Oliver has inadequate park space, they wanted the city to bring fixing the problem by purchasing the old school site for more park. I never agreed with assessment personally given proximity to the river valley. However, it still stands Oliver needs more parks as per the city guidelines. Good to have that confirmed. If it had been a lone house isolated against 111th that would have been problematic however the location just north of that apt building is a good one.